Hi everyone! I’m Mallory Pernell, MHA’s Communications and Marketing Associate, and starting today I’ll be taking over News from National. I am so excited to share with you what’s going on at the MHA National Office. If you have any questions, feedback, or just want to say hello, feel free to reach out to me at mpernell@mentalhealthamerica.net. As you may know, Congress is currently on August recess, but the advocacy community is gearing up for when they return. Recent statements from Senate leadership indicate that compromise over a final package of The Mental Health Reform Act of 2016, S. 2680, is going well and it may make it to the floor for a vote in September. On September 1st, MHA will be asking everyone to call their Senators to ask that S. 2680 be voted on in September and that they vote yes. Keep on the lookout for more information on MHA's Senate Call-in day closer to that date. Paul was in Philadelphia a few weeks ago for a meeting of national mental health parity advocates hosted by the Kennedy Forum and the Scattergood Foundation. He then traveled to Baltimore last week to meet with Under Armour and Public Inc. to discuss MHA’s work in mental health. On Monday, Paul was in Chicago to speak on hot topics in mental health for a meeting with the National Council of State Legislatures (NCSL) and its State Health Innovations Task Force. In the last News From National, we invited you to join MHA and I Choose Beauty to post the everyday beauty you see on Instagram or Twitter using the hashtags #IChooseBeauty and #MySilverLining, or download a blank card and share your thoughts. The examples of everyday beauty that many of you shared were inspiring, motivating and moving. Let’s continue to practice self-care together and motivate each other to seek out and find the beauty around us by joining I Choose Beauty on her next #IChooseBeauty challenge that starts Monday, August 15th. For questions or more information, contact America Paredes at aparedes@mentalhealthamerica.net. We know that prevention and education are key in addressing behavioral health issues, but we also recognize that we must tailor our efforts for the communities we serve. For many individuals, seeking assistance through a traditional hotline may not be the best fit. That’s where Crisis Text Line comes in. 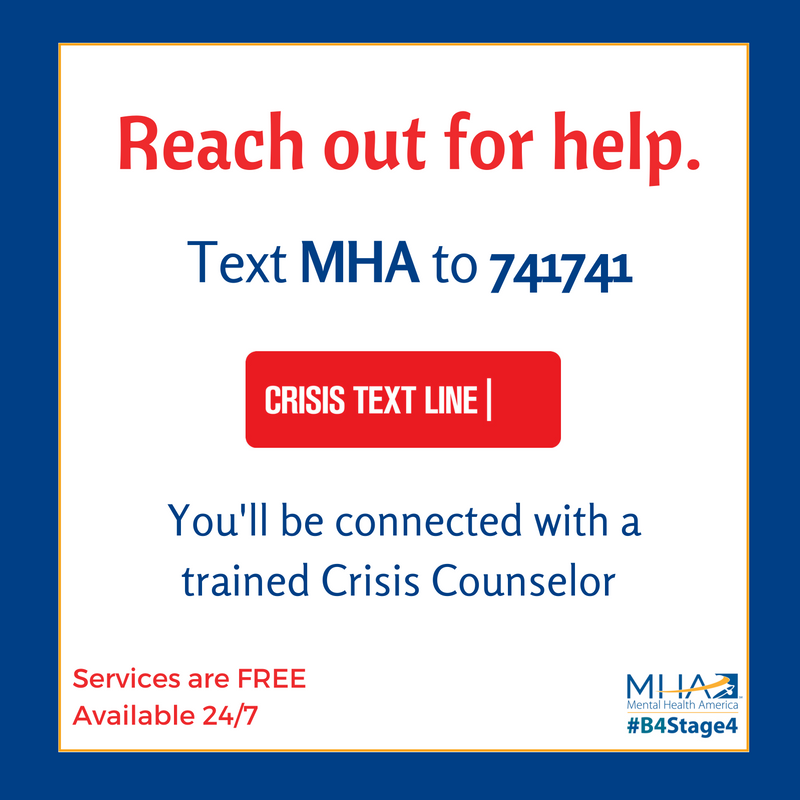 They offer 24/7 text-enabled crisis support for free that connects individuals to trained Crisis Counselors. We know the need exists and the value that this organization provides to individuals of all ages, so we are pleased to announce that we have formalized a partnership with Crisis Text Line. This partnership enables us to have our own unique keyword (MHA) and puts a great resource in front of our network. Anyone can use the service by texting the keyword MHA to 741741. They will be connected to a crisis counselor and communicate with them via text. For individuals who are unfamiliar with this organization and its services, check out http://www.crisistextline.org and this TED talk. We are releasing the 2016 Back To School toolkit just in time for the beginning of the school year! Back To School will consist of tools to use for social media as well as items for print. The toolkit will focus on body image, self-esteem and the disorders related to those topics. Back To School will be available Thursday, August 18th at http://www.mentalhealthamerica.net/backtoschool. For questions about Back To School, contact Danielle Fritze at dfritze@mentalhealthamerica.net. Approximately half of all Americans are not aware of the protections in place to guarantee equal insurance coverage for mental health, substance use disorder, and physical health care benefits. (1) Mental health and substance use disorder parity means that insurance benefits for mental health care and substance use disorder treatment must be comparable to physical health benefits. From now until August 31, the Mental Health and Substance Use Disorder Parity Task Force wants to hear about your experience with mental health and substance use disorder treatment services. How have parity protections affected you and what are your suggestions for improving awareness of parity protections and monitoring of health plans’ compliance with parity? Want to share your successful program or best practice and be featured in the Affiliates in Action newsletter? We want to hear from you and share your success stories with the Affiliate Network! Upload a submission at: http://www.mentalhealthamerica.net/affiliates-action. You will need your affiliate ID and Password to upload a submission. We invite submissions on an ongoing basis. However, the deadline for the summer edition is Friday, August 12, 2016. For questions, contact MHA’s Valerie Sterns at vsterns@mentalhealthamerica.net.